Sometimes it is needed to think over and to try to reach the deep roots of the matter we are talking. We are constantly listening about the so called “refugee crisis” but it’s time to rethink about the discourse we are told in order to understand the reality of what its happening. The European Union has perhaps the world’s most complex system to deter unwanted migrants. Since the 1990s, as borders have come down within Europe, giving most EU citizens free movement and passport-free travel, its external frontier has become increasingly militarised. Amnesty International estimates that, between 2007-2013, before the crisis, the EU spent almost €2bn on fences, surveillance systems and patrols on land or at sea. In theory, refugees – who have the right to cross borders in search of asylum under international law – should be exempt from these controls. But in reality, the EU has tried to prevent asylum seekers from reaching its territory wherever possible: by closing down legal routes, such as the ability to claim asylum at overseas embassies; by introducing penalties for transport companies that allow people to travel into the EU without the correct documents; and by signing treaties with its neighbours so they control migration on the EU’s behalf. And within the EU, an agreement called the Dublin regulation forces asylum seekers to apply in whatever country they reach first. After the Arab uprisings of 2011, the number of people coming to Europe to seek asylum – via Turkey, or across the central Mediterranean from north Africa – began to rise. But Europe continued to make security its priority, rather than the protection of vulnerable people. In the same period as it spent €2bn euros on border security, the EU spent only an estimated €700m on reception conditions for refugees. Almost 3 million people claimed asylum in the EU in 2015 and 2016 – still only a small fraction of the EU’s total population of 508 million – but the manner of their arrival was chaotic; thousands died in the attempt. Most of the migrants who arrived tried to continue their journeys to north-west Europe, and enforcement of the Dublin regulation temporarily collapsed. Border defences often produce or exacerbate the very problems they purport to solve, by forcing irregular migrants to take more dangerous routes, often with increasing reliance on people smugglers, which in turn encourages states to crack down even harder. In November 2017, a coalition of human rights groups published a list of 33,293 people who had died since 1993 as a result of “militarisation, asylum laws, detention policies and deportations” in Europe. But Europe has continued to try and push the thousands of uninvited migrants who try to reach European shores further and further away from the continent. A deal with Turkey, launched in March 2016, has reduced the movement of Syrians towards Europe, even though over 12 million Syrians remain displaced by the war – 5 million of these outside their country – and many are still in need of urgent humanitarian assistance. Even as Afghanistan becomes more dangerous, European governments persist in their attempts to deport many Afghans to Kabul. And to stem unwanted migration from sub-Saharan Africa, Europe has tried to strike deals to stop the people-trafficking routes that run across the desert and through north Africa. Italy has cracked down on NGO sea rescues and paid off militias in Libya, even as evidence of torture and abuse in Libyan detention centres trickles out; the EU has explored deals with Sudan’s repressive dictatorship; in Niger, one of the world’s poorest countries, European money, troops and diplomats have flooded the desert city of Agadez, to try to put a stop to the smuggling trade. Hundreds of thousands of vulnerable individuals will be directly affected by these new policies. We are often encouraged to think about “solutions” to the crisis, but there is no neat end to it. For as long as wars continue – wars that are sometimes started or joined by European states, or fuelled by their arms sales – people will continue to flee them. And others will continue to try to migrate even when states don’t want them to. But our governments’ efforts to stem unwanted migration can end up creating or exacerbating the very problems they purport to solve. Decisions to ramp up immigration control taken at moments of crisis, or in response to media pressure, can have profound and long-lasting effects – from the treatment of Windrush citizens in the UK to the thousands of refugees languishing in filthy camps on Greece’s Aegean islands. The crisis is not only the movement of refugees, but the border systems designed to keep them out – and it is still happening. Most of us are economic migrants – even if within our own countries – but the term has taken on a new and pejorative meaning since the refugee crisis. It is often deployed in much the same way that “bogus asylum seeker” was in the past by the British tabloid press – to suggest that people are trying to play the system, that their presence is the cause of problems at the border, and that if we could only filter them out, order would be restored. In fact, the history of migration is a history of controls on the movement of all but a wealthy elite. In the past, states sought to restrict the movement of their own populations, through slavery or serfdom, or poor laws and vagrancy acts; today the right to move freely within one’s own territory is enshrined in the 1948 Universal Declaration of Human Rights. Most of us take this right for granted, even though it is relatively recent. Now, instead, the movement of people across international borders is tightly controlled and regulated. As a proportion of the world population, the total number of international migrants – of any kind – has stayed relatively steady: roughly 3% since 1960, according to the sociologist Hein de Haas. This might seem surprising in an age where goods, communication and certain kinds of people can move with greater ease than ever before, but globalisation is a highly unequal process. Although the proportion of migrants has not grown significantly, the origin and direction of migration has changed: research by De Haas and Mathias Czaika suggests that people are leaving a much wider range of countries than ever before, and they are heading to a much narrower range of destinations than ever before. They are going to the places where power and wealth have become concentrated. Europe, and north-west Europe in particular, is one of those places. It is by no means the only destination – most African migration, for instance, occurs within Africa. And most migration to Europe takes place legally: an estimated 90% of migrants who enter Europe do so with permission. But wealthier countries are making increasingly severe efforts to keep out the uninvited: in 1990, according to research by the geographer Reece Jones, 15 countries had walls or fences on their border; by the beginning of 2016, that number had risen to almost 70.
International law aims to protect refugees while allowing states to retain control of their borders – but the definition of “refugee” status is political, and subject to a constant struggle over who is deserving and who is not. The term has both a legal meaning, in that it describes a person who is eligible for asylum under international law, and a colloquial meaning, in that it describes a person who has fled their home. Under the 1951 refugee convention, a refugee is defined as someone who has left their country due to “a well-founded fear of being persecuted for reasons of race, religion, nationality, membership of a particular social group or political opinion”. At first, the convention only applied to Europeans, and did not cover everyone who fled a war zone; this kind of protection was only created after pressure from newly independent African states in the 1960s and Latin American states in the 1980s. People forced from their homes by economic disaster or catastrophic climate change have never been included. Even today, the convention leaves power mainly in the hands of nation states. It does not oblige its signatories to give anybody asylum, merely to hear their case and not push them back to a country where they might be in danger. Empathy matters, but it always has limits, and it should not be a precondition for people to access their rights. Caesar arrived in Sicily in late 2014, rescued from a drifting smuggler boat in the Mediterranean by the Italian navy. When he arrived, Sicily had the attention of the world’s media: journalists wanted to know the stories of people like Caesar: where they had come from, what kind of journeys they had taken, what the worst things they had experienced were. But by the following summer, attention had drifted elsewhere. In late August 2015, as unprecedented numbers of refugees from Syria and elsewhere in the Middle East made their long walk through the Balkans, I was visiting Caesar at his home in Sicily. As we watched TV, which was showing looped footage of people clamouring to board trains to Germany at Budapest’s Keleti station, Caesar gestured towards the screen. “You see? 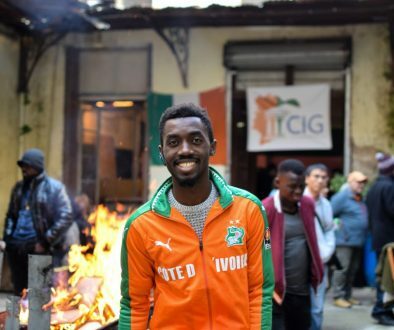 The cameras don’t come here any more because it’s only blacks arriving in Sicily now.” He felt very strongly that people like him had been abandoned – by the media, and by a system that was taking years to process his asylum claim. When there is a major disaster, the understandable response of journalists is to rush in and find the most urgent stories as quickly as possible. It serves a necessary purpose: to tell people what the problem is, who is affected and what help is needed. Aid agencies and NGOs often follow a similar logic in their public communications. The idea is that vivid “human stories” that focus on the experiences of vulnerable individuals – very often children – will elicit sympathy from an audience whose attention is fleeting. But these stories also have the potential to alienate. If I tell you that Caesar spent 18 months being handed from one trafficking gang to another in Algeria and Libya, during which time he was tortured and put to work as a slave, does that help you understand who he is and why he has made the choices he has – particularly if that is all you know about his life? And what if hundreds of people all have similar stories? At some point, we feel overwhelmed and start to switch off. Some of us may even start to feel hostile: why are we constantly being told to feel sorry for these strangers? What is more, media coverage that jumps from one flashpoint of a crisis to another can neglect to examine underlying causes – Europe’s complex border system, for instance. And a sense of panic can inadvertently be encouraged by well-meaning attempts to produce dramatic statistics and soundbites. The idea of a “global refugee crisis” may provoke sympathy among some, but for others it may increase the sense that we are, in the words of Ukip’s leave campaign, at “breaking point”. The UN’s refugee agency, the UNHCR, says there are more people displaced by conflict in the world today than at any point since the second world war. This is true: an estimated 66 million people are currently displaced, either within their home countries or abroad. But 86% of these remain in the developing world, not in wealthy regions such as Europe. And despite recent conflicts, according to De Haas, refugees account for around 0.3% of the world’s population; a small and relatively stable proportion. The problem is one of resources and policy, not overwhelming numbers. If we want to understand why some people will keep moving despite the obstacles put in their way, then we need to see the whole person, rather than only the worst aspects of their situation or their most traumatic experiences. I have met a number of people who had journeys similar to Caesar’s, and each one is trying in very different ways to retain control of their lives and make decisions about the future. Caesar told me he just wants to find a dull job and “forget about the past”. By contrast, Fatima, a woman from Nigeria who also ended up in Sicily, made “a bargain with God” when she stepped on to an inflatable boat on the Libyan coast, and wants to devote the rest of her life to raising the alarm about trafficked women. Azad fled Syria because although he was sympathetic to the uprising against Bashar al-Assad, and proud of his Kurdish identity, he simply didn’t want to kill people. It is also important to recognise that the stories we consume are, for the most part, commodities produced by profit-making companies. Like other commodities, their production, value and demand are driven by market forces. This can harm those at the centre of the stories, distort our understanding of a crisis and even contribute to a sense of panic – which, in turn, provokes panicked responses from the authorities. Both visions are wrong. The first tries to erase the fact that Europe is a diverse continent, in which Christian, Muslim, Jewish and secular traditions have been present for centuries. Orbán’s vision also has a liberal companion, especially popular in western Europe, which holds that Muslim immigrants present a threat to “European” traditions of tolerance, freedom and democracy: this, too, ignores the fact that where these principles do exist they have been fought for and won, usually against the violent resistance of European elites. It is no small irony, either, that many of the refugees who arrive on European shores today have been engaged in similar struggles for rights and equality in their home countries. The second vision presents Europe as a beacon of hope to the rest of the world. Europe certainly has great power to affect the world for better or worse, and pressing our politicians to live up to such an aspiration is worthwhile. But the aspiration will remain unfulfilled if we ignore the fact that while the nations of Europe have overcome war and fought totalitarianism, many of these same nations became rich and powerful by conquering and administering huge empires, which were partially justified by the idea of European racial supremacy. And European unity, in its founding documents, was conceived of as a way of maintaining imperial power, as well as preventing future conflict in Europe. Rather than seeing European racism as a thing of the past, the recognition of its persistence is essential if we are to understand the refugee crisis and some of the responses to it. Thousands of people from former European colonies, whose grandparents were treated as less than human by their European rulers, have drowned in the Mediterranean in the past two decades, yet this only became a “crisis” when the scale of the disaster was impossible for Europeans to ignore. In 2015, the UN’s special rapporteur on migration proposed two responses that would have done much to alleviate the crisis: mass international resettlement of refugees from Syria, and a temporary work visa scheme so that economic migrants could come and go, without getting trapped in the deadly clandestine routes. The reason this hasn’t happened is because European governments simply don’t want to do it. There are domestic political pressures within Europe, and a wider crisis of the international system through which conflicts and disagreements between states are supposed to be resolved. Even now, a hierarchy of suffering pervades much of the debate, in which people’s struggles are ignored or dismissed depending on their background, with little discussion of how Europe might have contributed to the situation of the countries the migrants leave behind – either historically, or through the military and economic policies of current governments. And when local conflicts involving newly arrived refugees break out in European countries, many commentators jump seamlessly from an incident that needs a considered response, to declaration of an existential threat to Europe from its Muslim minority. At its extreme end, this is genocidal logic, of a kind Europe has known in its past. The Holocaust is never far from the surface of European consciences. And its presence has been felt in a range of responses to the refugee crisis – from grand political statements about Europe’s duty to act, to the invocation of the Kindertransport in Britain’s debate over child refugees, to stories about elderly Jewish Europeans helping today’s displaced migrants cross borders. But it can lead us to a Schindler’s List interpretation of history – the one dramatic moment of rescue that either averts disaster, or absolves us of a greater crime. An awareness of this history matters, and can motivate us to act, but there are considerable differences from the past. Our system of refugee protection was set up primarily to deal with the huge population upheavals in Europe that were caused by the two world wars. Now largely in the past, these upheavals are generally seen as having provided a moral lesson – one of several ways in which Europe declared: “Never again”. But although Europe’s crisis of displacement had a beginning and an end, for much of the world, displacement is persistent, its causes apparently more complicated, the people at the centre of it afforded less significance. Often, they are given no story at all, reduced to a shadow that occasionally flits across European vision. But it is vital that we pay attention, not just for humanitarian reasons but because displacement points to a dangerous weakness in liberal democratic societies. Although we have come to regard certain rights as fundamental and universal, these are often only guaranteed through membership of a nation-state. In her 1951 book The Origins of Totalitarianism, the political theorist Hannah Arendt argued that the inability of states to guarantee rights to displaced people in Europe between the world wars helped create the conditions for dictatorship. Statelessness reduced people to the condition of outlaws: they had to break laws in order to live and they were subject to jail sentences without ever committing a crime. Being a refugee means not doing what you are told – if you did, you would probably have stayed at home to be killed. And you continue bending the rules, telling untruths, concealing yourself, even after you have left immediate danger, because that is the way you negotiate a hostile system. But the presence of millions of displaced people also became a powerful tool for those regimes that wanted to undermine the idea of universal human rights. “Look,” they could say, “there’s no such thing; you only get rights by being part of the nation”. Instead of resolving this problem, governments cracked down on unwanted migrants, giving police forces extensive powers that were eventually also wielded over their own citizens. This happened in the western European democracies, argued Arendt, and not just in the totalitarian states. This has a disturbing parallel with the new powers and security infrastructure – from Britain’s “hostile environment” and laws criminalising European citizens who help migrants to the “temporary-stay facilities” that Italy’s new, far-right interior minister has proposed as part of a plan to increase deportations – that European governments are creating. Far from being the barbarians they are often portrayed as – a mass of “illegals” threatening European security and identity – rightless people appear “as the first signs of a possible regression from civilisation”, Arendt warned. But Arendt points out a threat, not something inevitable – and importantly, governments respond to pressure from the electorate. 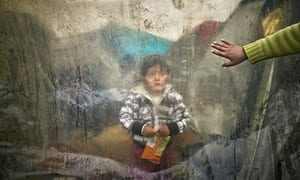 In the autumn of 2015, for instance, public outcry over the photograph of a drowned toddler, Alan Kurdi, that circulated in international media pressured the British government into expanding a scheme to resettle Syrian refugees. We must be alert to the ways in which some politicians try to convince people to give up rights and protections that exist for the benefit of everyone. Any authority figure who says: “We should look after our own before we look after refugees,” probably isn’t interested in doing either. And we should recognise the importance of collective action. There will not be “solutions” to this crisis, in the sense of one or more policy decisions that will make refugees vanish. Wars produce refugees. People will continue to move to improve their quality of life – not only because of extreme poverty, but because they are connected to global culture and global networks of communication. Climate change has the potential to create far greater displacement than we have seen in recent years; as with refugees from war, it is likely to be poorer countries who feel the greatest impact. We cannot control whether these things happen; what matters will be how we respond, and whether we repeat the errors of this crisis. You do not have to let your thinking be limited by the categories that currently exist. It is possible to defend the protections that the current system of refugee law offers, while recognising their limits. Politicians may try to draw a distinction between “genuine” refugees and other irregular migrants, and our economy may assign relative values to people’s lives based on their use as workers, but that doesn’t mean we should accept that one of those people is any less a person, or that their experiences are any less real. Refugee law provides an essential protection for some kinds of displaced people, but not all of them. Drawn up in a world where power and wealth are unequally distributed, it has always reflected the concerns of the powerful. The more rigidly we enforce distinctions between the deserving and undeserving, the more likely we are to accept the violence done in our name. Throughout 2015, I kept hearing and reading about refugees having a “dream” of Europe. Perhaps that’s the case; we are all moved at times by an ideal. But it implies a certain naivety on the part of the beholder, that someone is being pulled by an illusion that the rest of us do not share. It belittles them, while at the same time aggrandising us. To the European audience, and by extension audiences in other rich parts of the world, it is reassuring: they are dreaming of having lives like ours – and who can blame them for idealising our existence? Yet it is striking how often the word “dream” seems to crop up in place of the less comforting words “want” and “need”. This person has arrived in Europe and they want to go to Britain, where their uncle lives. Wouldn’t you? This person needs to get to Europe to work. Why can’t they earn a living at home? Why should anyone have to put up with these conditions? Whose interests does it serve to regulate their movement? And how likely is it that states which treat migrants with such callousness will behave similarly towards their own citizens? These, I think, are the sorts of questions we should be asking. ANNOUNCEMENT	Migrant camps reopening on Greek mainland.